Weather discussions by Gert & Dave during the 2018 Atlantic Hurricane Season. The homepage with the links to local reports from the islands, latest satellite image, current weather outlook can be found here. March 19 Update: The situation is still quite dire, check out this comprehensive article in the Washington Post. Good places to donate: Crisis Relief - United Nations, Medecins sans Frontieres (Doctors without Borders) or Unicef. Have not posted lately due to numerous personal events so sorry if you have missed my posts and updates. However, I am still here! Thanks to Gert for holding my end up! Potential named storm Patty, now 96L, is located a few hundred miles to the east of Guadeloupe as a discombobulated, wind sheared system. Moving to the WNW at about 8 mph, 96L is naked below the waist, aka south of the low pressure center, due to the wind shear force field that has been protecting the island chain all year long. This means almost all of the strong thunderstorms and winds are to the north of the "center". Winds are approx. 35 miles an hour technically meaning TD status but there is no defined closed circulation hence still it remains a strong tropical wave, at this time. Due to the strong wind shear, 96L is not expected to develop around the northern Leeward Islands but will drop 1-6 inches of rain with gusty winds and angry up to 10-12 foot seas. Down the road, wind shear will lessen and the seas will be a bit warmer leading to probable Patty named status, giving the Turks and Caicos and maybe the lower Bahamas some worries. But, that should be the extent as a strong front coming off the coast should intercept probable Patty and turn her out to sea, giving Bermuda a dousing on the fast track by while the Florida coast breathes a late season sigh of relief. For those who wonder where all the rain is coming from all of a sudden, November is one of our historically rainiest months. The rains are not surprising and neither is a late season spin up. Official season ends in 18 days. It has been so far, a lucky year here around the eastern Caribbean as the continuous wind shield just to our east has been a formidable adversary to approaching systems since May. Monday, November 12, 2018 09:02AM PST - Patty? Thursday, October 25, 2018 08:58AM PDT - Oscar? Looks like we might have another named storm this year! Invest 95L is about 800 miles east-northeast of the islands, and has a 70% chance to become a tropical cyclone over the next 48 hours. Looking at the spaghetti plots (see links above) it doesn't seem to be a threat to the islands. And if it makes that sharp turn north before it gets to Bermuda they should be fine as well. In the Pacific on the other hand, the Northern Mariana Islands got slammed by an Irma-like storm named Yutu yesterday and Mexico earlier by Category 3 storm Willa (which was a Cat.5 just a day earlier). Remarkable about both storms is the rapid intensification. Wunderground reports that Willa went from a tropical depression on Saturday to a Category 5 storm on Monday, a record setting 54 hours, and similar to Maria in the Atlantic last year. Yutu as well went from 75 mph (Cat.1) to 180 mph (Cat.5) in just 30 hours. As you can imagine the situation is not good. The islands, close to Guam, are part of the US Commonwealth. But not sure if that really helps with the recovery seeing what the US Government did for Puerto Rico and the US Virgin Islands. The tropical disturbance far east has been upgraded to tropical storm Nadine. So now we have three storms at the same time in the Atlantic this late in the season. A first? 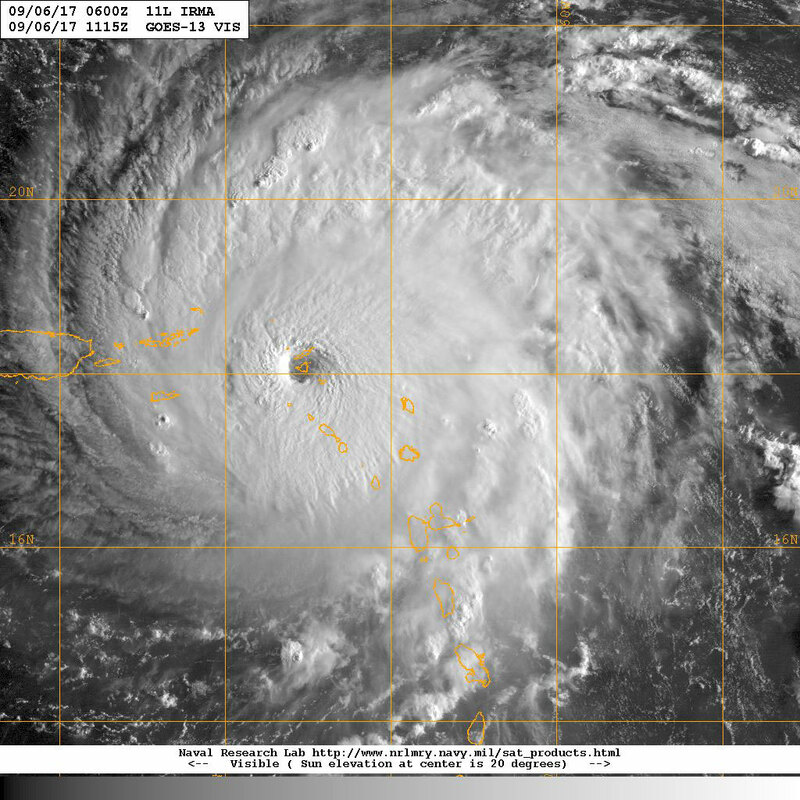 Nadine is not a threat for the islands. It is turning more northwest where it will find colder water and higher wind shear, so not a very long lived storm it seems. Meanwhile, Leslie is still churning around in the Atlantic, it formed September 28 not far from where it is now. But it looks like it is finally on the move, heading towards Madeira and Portugal/Morocco, the wrong way indeed. 2PM Update: Michael is now expected reach Category 3 (major) status before making landfall in Florida. While the Pacific Ocean has quieted down a bit and the Atlantic still has TS Leslie wandering around the park looking for a date, any date it seems, the SW Caribbean and the GOM have activated right on cue weather timing wise with the introduction of TD#14, with a christening event later today introducing TS Michael which should happen as or after recon has investigated the system. This flight just took off. TD#14 has definitely consolidated his chances of reaching named status this morning while fighting some dry air intrusion from the west plus a healthy prescription size dose of wind shear. However, that wind shear is expected to lessen as it moves slowly north about 3 mph. Flooding rains and landslides have already affected the Central American countries of Nicaragua, Costa Rica, Belize, and Guatemala. Honduras, the Yucatan Peninsula, and Cuba will be next. 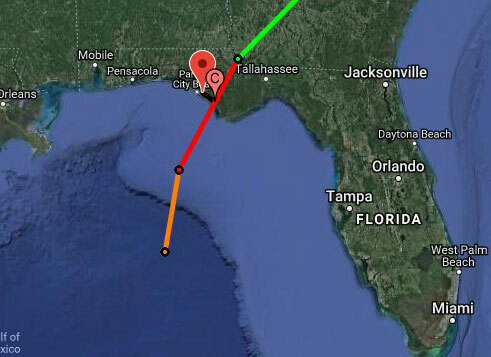 Track forecast is trickier with most models landfalling Michael between Miss/Alabama border and the Florida Panhandle. We all know, that those points are not very far apart. It appears the bulk of the action and moisture will be on the over loaded east side at the moment and that will not be good for the SE although many areas can use the rain from southern SC to Central Florida. West coast of Florida, do not be complacent. A Tampa hit is not out of the question at this moment. Cones have errors and the Tampa shield will not last forever. All in all, at this point, the gulf coast will get a hurricane and it will bring drenching rains to the SE coast and also to the Carolinas and Virginia where no more rain is needed courtesy of Hurricane Florence's unwelcomed visit last month. And one other thing, October hurricanes have been pretty nasty over the years. Preparation folks is the key. A revitalized TS Kirk was reenergized by warm ocean waters and low wind shear this morning after rising to TS status then being relegated back to an open tropical wave after trying to fend off a late season slug of Saharan Dust. Now, with the comma shaped head of a wind sheared tropical system, it sets its sights on this years common area of tropical attraction: Martinique, Dominica and Guadeloupe. TS warnings are up for those islands in addition to St. Lucia and Barbados. With it's elongated stature, the 60 mph winds it currently boasts will not be the main impact. Rain, and a lot of it will be. Speeding along at about 18 mph and fighting increasingly volatile wind shear, Kirk is expected to weaken but weakening means spreading out like Florence did. So, main impacts will be very gusty winds, heavy rains and dangerous seas across most of the island chain. That is the forecast. Since it is speeding along, expect conditions to deteriorate tomorrow among the outlying rim islands and Friday the impacts will be considerable among the northern islands. A weaker Kirk will likely trek more westerly while a stronger Kirk will want to use the earths spin and a weak spot in the ridge to the north. Lets just hope for all of us, wind shear does it's job again. Wednesday, September 26, 2018 09:05AM PDT - Kirk is back! After last weeks frenetic activity in the Atlantic culminating in a tumultuous Hurricane Florence landfall in the Carolinas, a few days respite was observed in the Atlantic basin. How short lived that was. First we have a non tropical low which spun off from a front that was carrying the remnants of Florence across the North Atlantic. This will probably become first sub tropical then tropical over the next few days and being a 'cut off" low, it will have weak steering currents leaving it a wandering name with no particular place to go until the next front swoops in and carries it to the UK and Europe possibly affecting the Azores directly on the way. Interesting enough, they have been pretty busy dodging storms there this season already. This is 90L and maybe even Leslie. Next is 98L, a few hundred miles south of Bermuda, the spawn of Florence. However, it will not be renamed Florence if it attains named status. Current forecast thinking is it does minimally develop and head towards the Carolina coast but on the way, the cavalry will ride to the rescue in the form of that weather super good guy, wind shear. Seems like wind shear is almost every where in the Atlantic right now and has been particularly strong across the Caribbean. At this time, 98L or whatever it becomes is expected to skirt the Carolina coast and OBX before the next front carries it away. Still, even the thought of this is creating anxieties where Florence plodded ashore. Something to keep a close eye on if wind shear doesn't arrive timely. TD#11 is going to have a short shelf life if forecasts are accurate. Once again, wind shear is expected to be ferocious as it makes it's way WNW towards the islands. If this holds true, it will be nothing but a regular tropical wave with some vigor as it passes through. Some flash flooding is a possibility. Like Isaac and Beryl, no match for the dynamic duo of wind shear and dry air. On to what we know now as TS Kirk. Kirk has formed at a very low latitude, about 8.3 N with 40 mph satellite derived winds. It's till September and CV storms are still in vogue. Kirk is not an anomaly and definitely warrants our attention here in the islands but it has some usual suspects to overcome. Two of those are well known and mentioned above: wind shear and dry air with a big dose of Saharan Dust which seems more prolific this late in September than other years. SST's are conducive and will be for the remainder of his travels so they are not an issue. The one unusual suspect is his formation below 10 N. This puts TS Kirk closer to the equator where he cannot take full advantage of the earths rotation to spin up and start circulating. Kirk is expected to develop another issue soon and that's a fast forward speed. 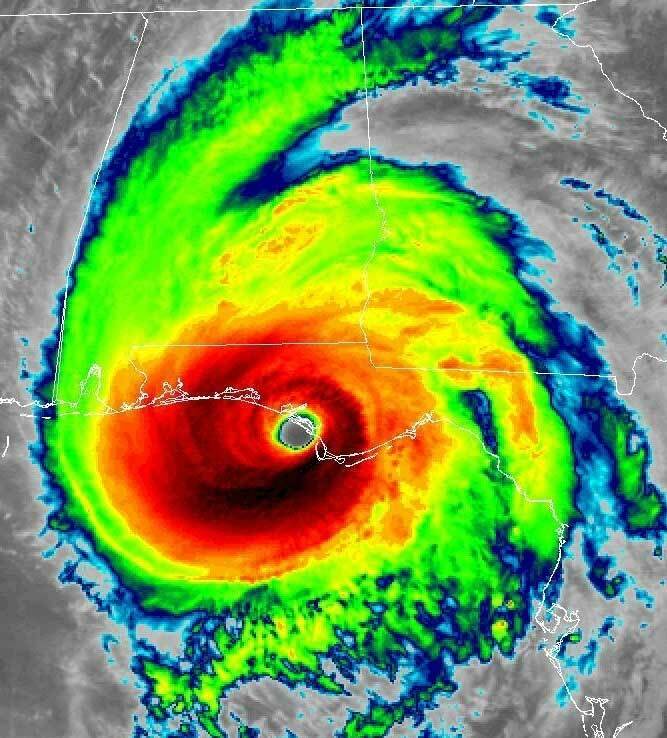 Once he starts trucking along about 20-25 mph it will be hard for the COC (center of circulation) to keep up which will negatively affect his structure and growing prospects. Once Kirk makes his way close to the Caribbean, wind shear is expected to slam his door shut on further development and might even tear him apart as has been customary so far. But that is 4-5 days out. Still, never trust a CV storm. Plus, if he muscles his way through the islands, the Western Caribbean and GOM could have a real problem on their doorstep. The tropical wave just off the African coast is now tropical storm Kirk. The storm is at quite a low latitude, only 8.3N. 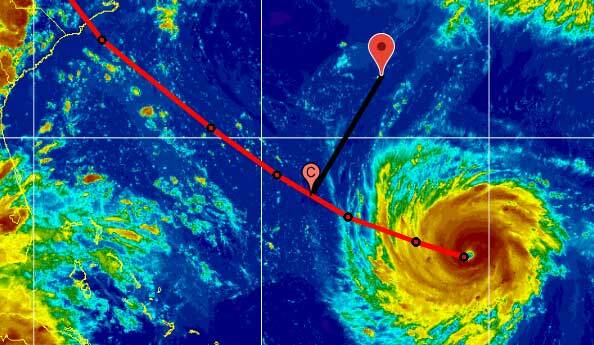 Its projected path is pretty much due west, which could take it close to Barbados on Thursday. So far it is not expected to become a hurricane. Waters are plenty warm, and wind shear is not that high, but the low latitude and expected speedy forward motion won't help. Let's hope that holds true! 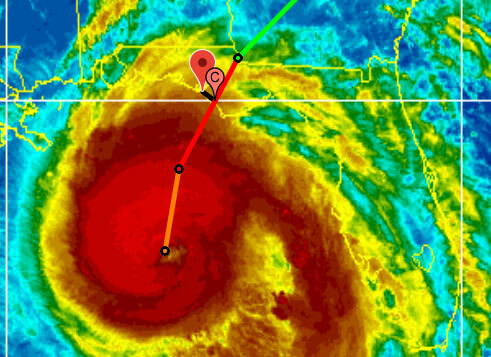 Use the closest point of approach-tool to check when and how close it can get to you. Tropical depression 11, much closer by us, is not expected to be much of a threat. It is kind of stationary, and about to fall apart and become a tropical wave. Thursday, September 13, 2018 18:29PM PDT - Bye, Bye Isaac? 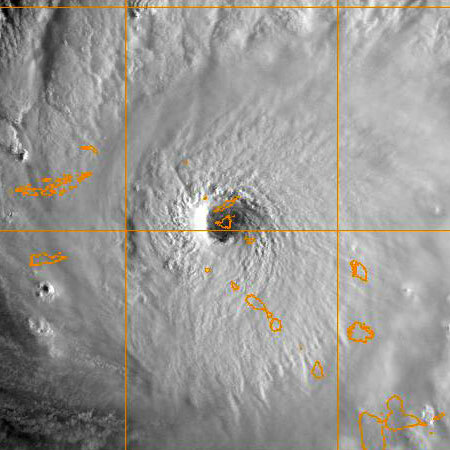 Well, it looks like Isaac was an almost non-event, judging from the reports from Dominica and surrounding islands. Although it has not passed totally, there is still some significant rainfall coming, judging from the satellite image above and radar loops of Martinique and Guadeloupe. As this is mainly about the Caribbean, I will start with what is about to really affect the Caribbean and that is Isaac. Now, TS Isaac has not played in the sandbox with forecasters very well since his humble beginnings west of the Cabo Verde Islands. Forecast to become a hurricane of even a Cat 2 possibly, he never has reached his potential and that is GREAT news for all of us in the Eastern Caribbean, especially those of us who experienced Irma and Maria last year. However, some of the islands those storms did impact, regardless of Isaacs potential or not, will be experiencing TS force winds and up to possibly 8 inches of rain. Montserrat, Dominica and the butterfly island of Guadeloupe are all under TS warnings. TS force winds do extend outwards of up to 175 miles and much of that is to the south which is quite uncommon as Gert mentioned previously. Rainfall that affects Puerto Rico, the BVI's, and down to St. Maarten will be in the form of squalls and thunderstorms about 1-4 inches. But as we all know, one thunderstorm can drop 1-4 inches in just one hour so flooding in isolated locales is a possible issue. As TS Isaac moves through the middle islands tomorrow, it is forecast to weaken due to the relentless wind shear attack. That is what some models say and is entirely possible. Isaac then enters the Eastern Caribbean graveyard where most storms never form or fight to stay alive if they have life already. Where am I going with this? If Isaac, and remember, he is an "I" storm, makes it with it's basics intact through the graveyard, then we could have a major problem in the Gulf of Mexico or even Central America depending on the steering currents at that time. Jamaica and the Caymans could feel a rejuvenated TS. Time will tell for that scenario. Behind Isaac, Hurricane Helene is showing no interest in chasing a weakening Isaac, which again is GREAT news for us here. She thus sets her sights on a date with the Azores this weekend. Might be a brush by or a direct impact as a weakening TS but effects will be felt nonetheless. Sub Tropical Storm Joyce, a newbie to the scene, will meander aimlessly in the Atlantic for a few days SW, turn abruptly NE and follow then TS Helene to the Azores region. So the Azores will probably have issues over the weekend and into the beginning of next week. Joyce does have the chance to become a real TS over the next day if she can acquire more "tropical like" characteristics and that is the official forecast. But it will be short lived. 95L is throwing a temper tantrum in the Gulf of Mexico with the SW Texas coast as it's main objective. Here we have another area that does not need anymore rain. Forecast to become a tropical depression, maybe a minimal TS if time over the water provides, wind will not be the problem regardless of those classifications. Once again, it will be the heavy rainfall accumulations over already saturated ground. Hurricane Florence, as I have shared for days, will be devastating especially in the storm surge and flooding arenas. Wind damage will be the same along the coast and if she meanders along the coast for a few days as projected at this moment, a relentless ocean pounding will be epic. By the way, just because Florence is forecast to drop in intensity right before the coast does not mean your in the clear if you refused to evacuate. It does not make it right you stayed. As Gert shared, your stupidity and arrogance could cost you your life or someone elses who tries to rescue you. Leave now if you still can and are under mandatory evacuation. Material things can be replaced. The joyride is not worth it. Isaac looking worse today, but a hurricane hunter plane still found 60 mph wind. The convection now seems to be to the south-east of the center. So while I was saying that the northern part of the storm was strongest, now it looks like the southern part of the storm carries the brunt. So islands south of Dominica pay attention! See screen grab below (from the closest point of approach (CPA) tool). Not much else has changed qua track, but I wouldn't focus too much on where the center is right now. Tomorrow is the day! After Isaac crosses the island chain it is expect to weaken into a tropical wave. Isaac has now officially weakened to a tropical storm, but with 70 mph winds, is still a borderline hurricane. Forecast show that is will be around this strength when it arrives at the Islands, although it might be a lot weaker. The forecasted track has been pretty consistent, taking it over Dominica on Thursday. Tropical storm and hurricane watches have been posted (see the advisories). Water not the wind will probably be the biggest threat. Isaac is moving at 16 mph, and is not expected to slow down, so hopefully the rains won't cause too much flooding on Dominica and surrounding islands. The punch of this storm will be in the tail end, so keep that in mind. Not much has changed with Isaac with the new advisories and since Dave updated us (see below). It hasn't strengthened more, max. winds still 75 mph (Category 1), and still going due west. The eye is expected to cross the island chain at Dominica, who is still recovering from Maria, in three days... The only positive I see is that Isaac is relatively small and that it is expected to weaken in about 2 days. So hopefully it will weaken enough that it will not cause too many problems. See how close it can get to you with this handy tool. Keep in mind that it is still 3 days away, so it can go north/south in the meantime! Not sure where it will go after it moves into the Caribbean Sea. Hopefully it will just degenerate into nothing. As for Florence, it is now a Category 4 storm, packing 140 mph winds! It should stay safely (350+ miles) south of Bermuda. See screenshot below from the Closest Point of Approach-tool, showing distance vs. size of Florence relative to Bermuda. It is expected to make landfall as a Category 4 storm in the US... If you live on the US East coast, I added a list of US cities to the Closest Point of Approach-tool, so you can see how close it can get to you, and how forecasts are 'trending' over time... See also the Florence tools above for more info. Remember, most storm deaths are due to water (storm surge or flooding), not wind force... In the Carolinas the storm surge could be as high as 15-10 feet, see Jeff Masters' blog at WeatherUnderground. His bottom line: "if you are told to evacuate for Florence's storm surge, get out! And don't wait until the last minute, or it may be too late to save your life.". Don't be stubborn (ie. stupid)! Today. Sept. 10th. 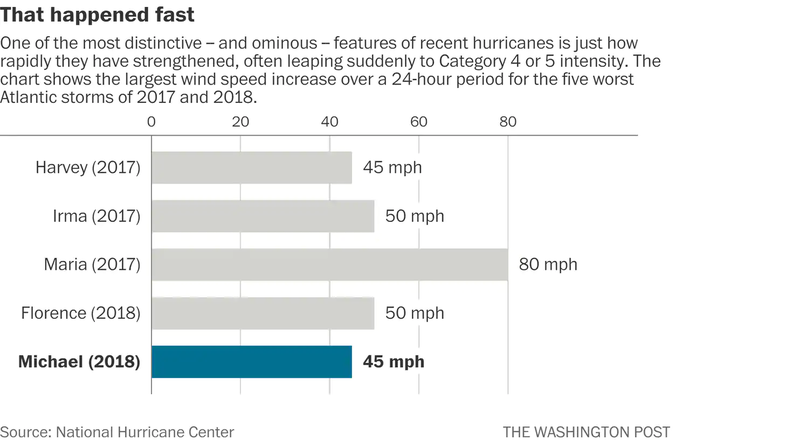 The historical "Peak" of the hurricane season and this 2018 season is one to remember already. It is apparent, especially with Florence, it might never be forgotten. Pandora's Atlantic and Pacific boxes have been opened and the jailbreak of September commenced. Hurricane Olivia in the Pacific will degrade to a TS by the time she makes history herself by approaching and striking the Hawaiian Islands from the NE, probably around Maui. This will be the third names storm to hit Hawaii this EPAC season. 3 hurricanes are on the map today in the Atlantic along with two areas of interest. Hurricane Helene and one of the AOI's up by the Azores will not be affecting any land masses in the Caribbean or the mainland US. Helene is throwing a scare into the Cabo Verde Islands and actually has the potential to turn into a Cat 2 before going fishing. The AOI up by the Azores appears to be non threatening and will go fishing as well, development or not. Hurricane Isaac. Historically "I" storms have a bad reputation and that is well deserved. "I" is late in the alphabet of storm names which means we have had a lot of activity already and they usually show up in the heat of the season. 10 "I" named storms have been retired from the name list, the most of any letter. Irma, Irene, Isabel, Ike, and Ivan to name a few. Fortunately, at this point, compact little Hurricane Isaac is not trying to get on the "I want to be retired list" of storm names. Isaac is forecast to strengthen into a Cat 1 and maybe even a Cat 2 before encountering our favorite storm devourer, wind shear. Look what the wind shear did to Hurricane Beryl earlier this year. Isaac is expected to follow, for the most part, a westerly track and will start to affect the islands Thursday and pass in between Montserrat and St. Lucia Thursday evening as a cat 1 or strong TS. This track puts Dominica squarely in the front sight of Isaacs barrel. With these islands still in recovery mode from last years Irma/Maria onslaught, Isaac couldÂhave major impacts evenÂin a reduced state. The possibility of Isaac to traverseÂon a more southerly track is doubtful while the possibility of Isaac taking a more WNW track is a possibility if the ridge to the north reveals any slight weakness for him to exploit. This means any islands north ofÂMontserrat should still be vigilant until Isaac passes through and is past. Isaac is a small compact system and is vulnerable to large variations in intensityÂeither strengthening or weakening and a stronger system tends to lean more WNW. Just something to keep in mind. Isaac could be an issue down the road once into the Caribbean Sea so he will be around for awhile. Last but definitely not least is Florence, starting her RI phase on her way to a potentially catastrophic meeting with the Carolinas. As I shared days ago, this scenario was plausible with the ridging potential. Anywhere from northern GA to VA is technically in play for a landfall. The winds will be a major issue on the coast and inland for several hundred miles. The flooding has the potential to be epic. After landfall, Florence will be like a girl standing against the wall with no one to dance with and no where to go for what will seem like an eternity. Be prepared and make conscious, common sense decisions. From nothing to hectic. That is what just happened over the last week. From no storms to many and the wave train continues. "Tis the season but this is could be a nightmare for some. I'll start with TD#9, west of the Cabo Verde Islands. Forecast to move mainly west, TD#9 is expected to become a hurricane sometime Monday with it's sights set on our islands, still recovering from Cat 5's Irma and Maria just a year ago. The dreaded "I" name will be Isaac and initial thoughts are soon to be Isaac will affect the islands as a high Cat 1 or mid Cat 2, only due to higher SW wind shear dampening it's strength on approach. The SST's are plenty warm to support this storm and it will have a moisture envelope surrounding it which will insulate the system from dry Saharan air intrusion. It's track is determined by the strength of the high pressure ridge to the far north which is the same one steering dangerous Florence to the east coast. This means pretty much due west with potential landfall in the middle of the Lesser Antilles. While we have time to watch this scenario play out, we do not have much time to prepare. There is still a chance it can go north after finding and exploiting a weakness in the ridge but that appears unlikely at this point. Stay tuned. Invest 94L, ahead of TS Florence, will live a very short life, not reach named status, and will likely be absorbed by Florence who I fear will be making a devastating impact somewhere on the east coast as a possible Category 4 storm. 9:11PM PDT Update: Invest 92L is now Tropical Depression Nine. The 'potential tropical cyclone' just off Africa is now Tropical Storm Helene. Invest 94L is north (northwest) of us, no worries with that one for us. Confusing with 5 active systems! One year ago Irma, a strong Category 5, packing 180 mph (!) 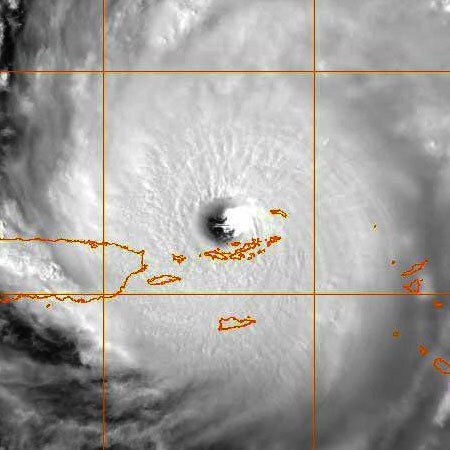 winds, struck the northeastern Caribbean, changing the lives of many (incl. mine). The pictures below speak for itself, still very scary when I look at them. In one year the islands have recovered amazingly well, but there are of course still a lot of issues that need to be resolved. Tourists are slowly but surely coming back as well, since the beaches are still as gorgeous as ever. Back to today..., Invest 92L is still just an invest, but that might change in a few days. It looks like it will still move north of the islands. Florence on the other hand is aiming for Bermuda and the US East Coast. 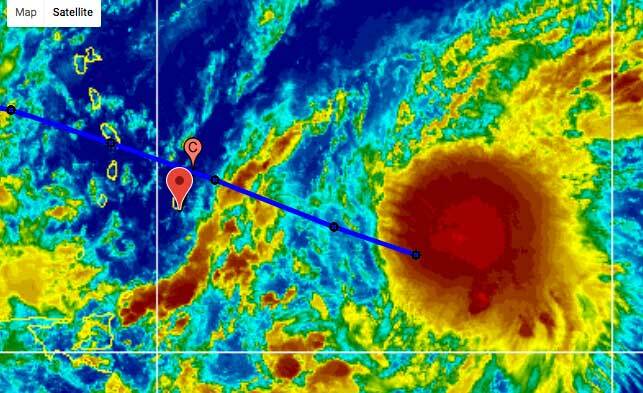 Right now (according to my closest point of approach calculator) it looks like that the center of Florence will pass about 200 miles south of Bermuda in 5 days. At that time Florence is forecasted to be a Category 3 hurricane. Hope it will stay that way. Wednesday, September 5, 2018 10:24AM EDT - Heads up!! Just a quick update on things which are rapidly heating up as was mentioned previously. First things first though. 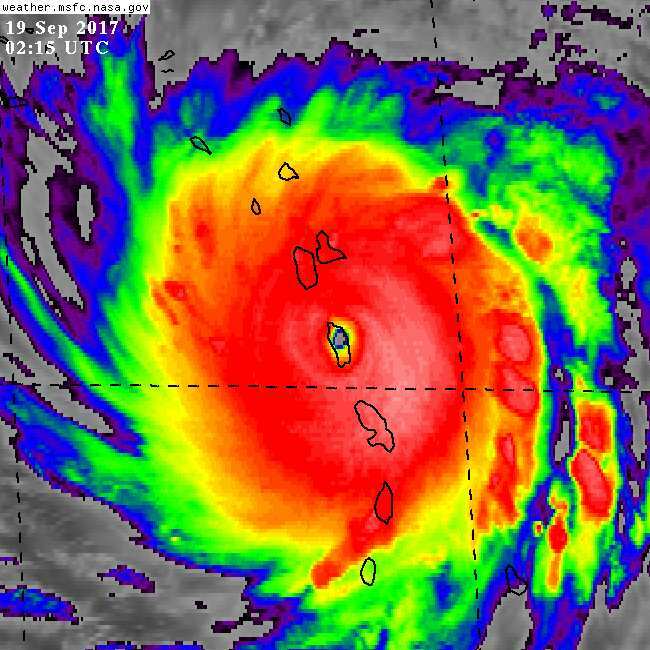 One year ago today, evil Hurricane Irma was clamping down on the NE Caribbean as the first of twin category 5 hits in a 12 day span. Unforgettable times. Unforgettable damage. I really hope no one forgets the lessons that Irma and Maria taught us. Major Hurricane Florence is the first major of the 2018 Atlantic season and is poised to make a liar possibly out of many who considered her a "fish storm" in the beginning. If she strengthens some more and the ridge stays weak, then a fish storm she may well be. However, and it's looking more likely right now, first Bermuda and then the Mid to Upper Atlantic coast could be in for a nasty surprise or a heckuva scare. This scenario plays out if the ridge strengthens, the trough that is supposed to pick up Florence doesn't, and Florence is then forced westward. Lots of variables with this one. The only good thing for us here in the Caribbean is I do not see an Irmaesque like trek sinking south towards us. If I was anywhere on the east coast though, say from mid Georgia northward, I would be a bit nervous and start doing some preparations just in case. 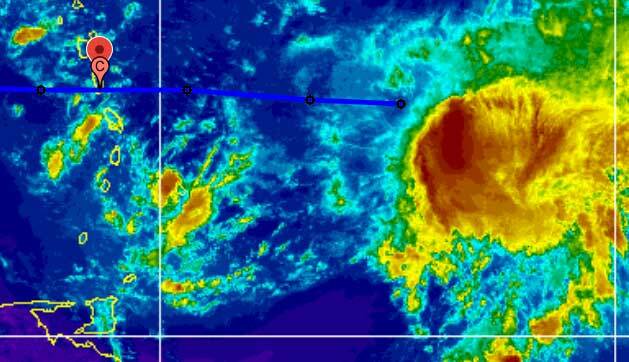 Florence will not be a polite visitor.ÂBermuda, you too. Out in the Atlantic, 92L, soon to be TD#8 and eventually Helene, has our attention here in the islands as does future Issac who is just a toddler at the moment over land on Africa. 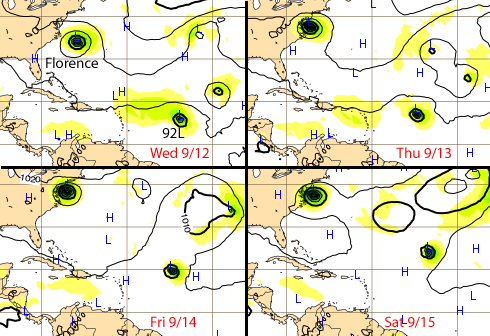 The latest model runs have shifted 92L more southerly and westward which is not a good track for the Caribbean. Something to pay close attention to as well as future Isaac, who the NHC has given a 30% chance of development over the next 5 days. Preparation is the key. We cannot stop them. Only be wise and prepare. Since early season Hurricane Beryl, the three named storms after have been unremarkable and short lived. That's a good thing. Now, we are entering the high time of hurricane season aka the month of September. Right on historical cue, the bowling alley across and off the coast of Africa has plenty of contestants lined up to take their strike at a name. TS Florence has been designated this morning by the NHC not long after exiting the coast. Florence has been tracked and analyzed for several days with great intensity while over land which doesn't happen very often. But, she was born to spin the moment she hit the Atlantic. Forecast track has Florence riding the southern periphery of high pressure until a weakness is felt resulting in curving to the NW mid ocean. This would keep her far away from land as a possible minimal hurricane. However, the chance to move west and not curve is possible. If the mid ocean weakness between the two high pressure systems does not develop, Florence will take an unlikely course west. Time and high pressure will tell. For the mean time, TS warnings have been dropped for the Cabo Verde Islands and Florence will continue on her WNW track as a TS for the most part. The next wave behind it will probably be unremarkable as well and become another "fish storm" but number three and four behind this one, still over land, will need to be watched with more interest and concern as that ridge to the north should solidify, leaving only a heading to the west as the only direction to take. It's easy to become complacent after getting hit in one year, especially twice in 12 days. History does repeat itself and that is a given. Not saying we will have a repeat but hopefully lessons have been learnedÂthat preparations and a watchful eye are necessary requirements every year. Several islands like Puerto Rico and Dominica still have not really recovered from last year and will be in dire straits should Mother Nature choose to be a meanie. Lets use our experiences from the past guide our intelligent decisions going forward. A new study by George Washington University and requested by the governor of Puerto Rico states that Maria caused an estimated 2,975 excess deaths. A lot more than the 'official' number of 64... See news article in the Washington Post. Thursday, August 23, 2018 11:12AM PDT - Where are the storms? I thought I had sent this early this morning but here it sits in my draft pile. Ooops! Sending now. It has been a while since my last post, partly because of a lack of activity in the Atlantic to even ponder about. That's the good news. However, it is about that time we historically see an uptick in activity and that is going to happen soon. Hurricane Beryl started things off in rapid fashionÂbut then the Saharan Dust Layer aka SAL, along with cooler than normal SST's, combined with that omnipresent wind shear to put a clamp down on Atlantic Basin development. The GOMEX aka Gulf of Mexico has plenty of heat contentÂto play with but wind shear and lack of opportunity has clamped that as well. 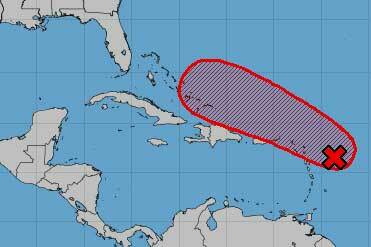 So, while sub tropical Ernesto makes a beeline towards Ireland and the UK from the Central Atlantic, we in the Caribbean and the Atlantic are staring at newly designated invest 99L, located about 900 miles to the east of the lower Windward Island chain or about 790 miles east southeast of Barbados. 99L does have a slight chance of development as it approaches the lower Windwards and Barbados but it's broadness plus a healthy ingestation of dry air and dust should limit it's potential for now. In addition, as it is below 10N, 99L is unable to take advantage of the earths spin, also know as the Coriolis effect which would enhance it's storm structure. Current consensus forecast track of this poorly defined system takes it's passage through the island change anywhere from St. Vincent and the Grenadines south to Trinidad and Tobago. Look for squally weather and some needed rain. Down the road things might get a bit more interesting in the Western Caribbean but first, itÂmust survive the Eastern Caribbean graveyard. The next 4-6 weeks look to be heating up with potentialÂwith the Gulf of Mexico looking particularly vulnerable.ÂNevertheless, wherever you are, be prepared! !ÂWe have the active part of the season just ahead! Monday, August 6, 2018 10:25AM PDT - Below normal season? While beautiful weather is here in central Pennsylvania, the same cannot be said off the coast of the Carolinas and soon, the mid to northern Leeward Islands and Puerto Rico. Closest to home, we have TS Beryl, once the Atlantics first hurricane of the 2018 season. About 190 miles ENE of Barbados as of 8 am this morning, the second smallest TS on record in the Atlantic basin is moving at a motivated 20 mph towards the WNW putting it on a collision course with Dominica, Guadeloupe, and Martinique. With wind shear increasing ahead plus a healthy ingestation of dry Saharan dust to it's north, TS Beryl will be on life support very soon. Its anticipated to drop to a TD just before tonight or after passing through the island chain. The islands will see some gusty, squally rains and wind gusts to maybe 50 mphÂwith accumulations in isolated spots of 4-6 inches but at her current forward speed, these spots should be a rarity. Regardless, these islands do not need Beryl as recovering from Hurricane Irma has been a slow progression. Some have no power still nor roofs. Further down the line, St. Croix will be the closest to Beryl's core, about 60 miles with again, squally and gusty rains and winds. Puerto Rico's SW coast and Hispaniola might see higher rain accumulations as well. By then, Beryl should have been disconnected from life support and officially become a remnant low of her former self. Farther out east, a new wave have fell off the African continent drawing scant attention with Beryl and Chris in the picture already. Later on this one around 14W. Off the Carolinas, about 150 milesÂsouth of Cape Hatteras lies a lurking TS named Chris. Set to sit and spin for a few days due to weak, almost non existent steering currents, Chris is eventually expected to be swept up by a mid week trough and carried outÂto the Canadian Maritimes possibly affecting Halifax and St. Johns with rains saved for a later date with the UK. Main effects continue for the Carolinas in the form of increasing beach erosion, strong dangerous rip currents and scattered pockets of rain. At this time, no US landfalls are predicted although there are a couple spaghetti models making landfall around Rhode Island and Boston. These are in the 1-3% category. Either way, for both of these systems, it's a good time to get your seasonal hurricane preparations up to speed.ÂThrow out the old stuff expired from last years hurricane kit. Update with fresh. Even bottled water goes stale. Friday, July 6, 2018 18:35PM EDT - July Storm Trio? I am traveling so this will be short as my layover is very short. Hurricane Beryl, small, compact and the little engine that could and did, is making a bee line for the island of Dominica as a Category 1 hurricane and the first of the 2018 Atlantic season. Beryl strengthened quite rapidly, going from TD to hurricane in just over 18 hours and it is possible, maybe probable that Beryl will reach Cat 2 in the next day or so. Beryl is not expected to grow in leaps and bounds and it also entirely possible it could slip in between islands due to its small, compact size. It also could actually drop down to TS status before it reaches the islands. With that said tomorrow will be a teller as there is much uncertainty with a storm of midget proportions. It can ramp up quickly; it can drop just as quickly, especially if it ingests some yummy Saharan dust to it's north. Chugging along at 15 mph, whatever Beryl remains or becomes remains to be seen. Heavy rainfall will definitely be an issue along it's path although that rain will be in a narrow range. Computer models are in good agreement of the forecast track and for the VI, Beryl should remain far to the south but still throw some gusty winds and rain squalls our way. Something Dominica and Guadeloupe do not need, especially with the ,mountainous terrain and valleys. Soon to be TS Chris is making a rambling, wandering appearance off the NC coast but eventually evacuating the area off the outer banks as the second hurricane of July. main effects as it's not supposed to make landfall will be high surf, rip currents, beach erosion, and heavy rain along the NC coast. Rounding out the spectrum could be the possibility of Debby making her entrance on the stage this July, spawned from the latest tropical wave to hit the Atlantic off the coast of Africa.ÂHer short term potential trek takes her more northerlyÂat this time but time will tell. Please prepare!! Even if you do not get affected, it will be a good practice run! More detail tomorrow. Have to catch a plane!! Hard to imagine it's hurricane season again but time moves inexorably on and we are now in the second month of official Tropical Atlantic hurricane 2018 season. Many still haven't recovered yet from the 2017 season with no power still, blue roofs, and non paying insurance companies. Normally the average for tropical storm development in July is one a year and are usually weak in intensity. 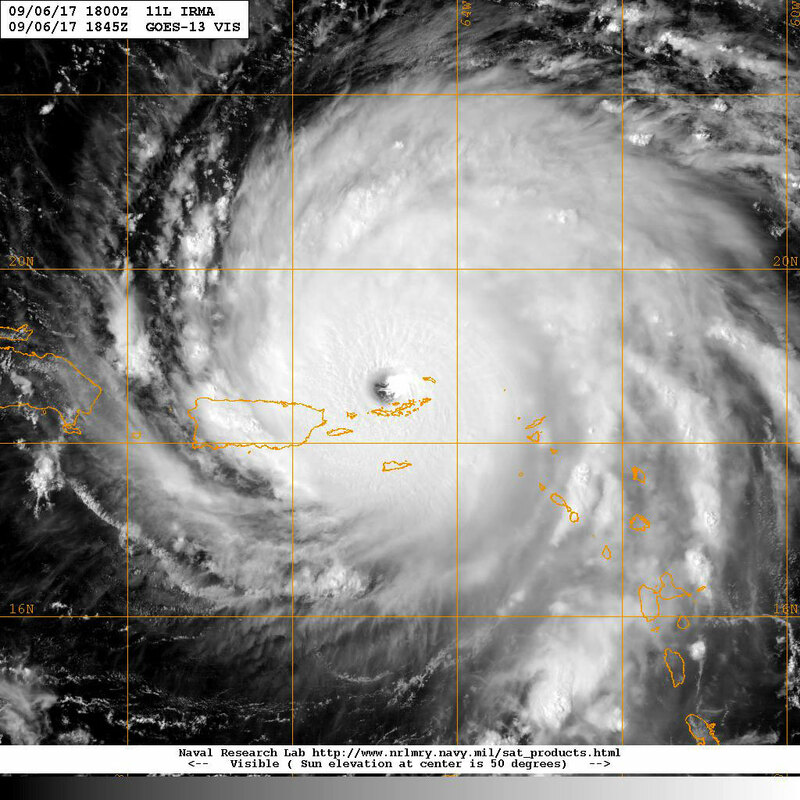 Hurricane Bertha, a bare 10 months after Hurricane Marilyn's appearance, in July of 1996, was an anomaly. Now it's possible we could see not one but two named systems within a week although the window is not open for long for both of them. The first, not even labeled an invest yet, is a trough of low pressure a couple hundred miles south of Bermuda, which has a chance to become Beryl but must do so by Sunday when a trough is expected to sweep it out to sea. SST's are warmer in the sub tropical Atlantic and wind shear moderate so it has a good chance. All models forecast no interaction with Bermuda or the East Coast except high surf and dangerous rip currents. The second, definitely more interesting to us here in the Caribbean, is an invest and it's 95L. Yes, the NHC skipped a few numbers but that's their prerogative. 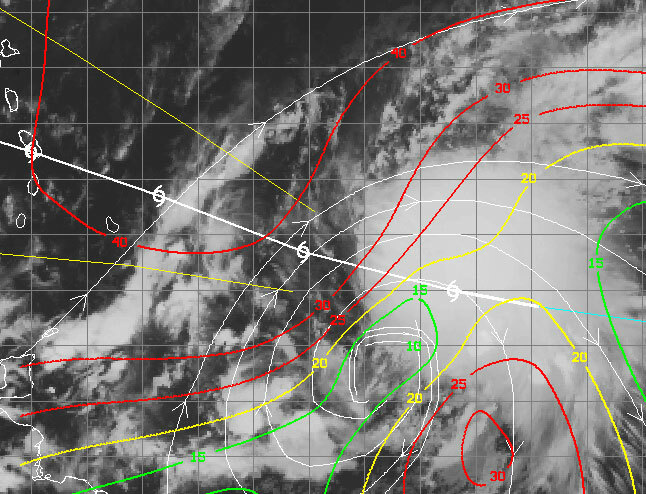 Categorized at the moment as a "vigorous" wave, 95L is located approx. 33W with most convection south of 16N and a 1009mb center located at 10N. Moving mainly west at 10-15 mph, 95L is showing slight signs of organization as it moves toward warmer, more friendlier waters. The computer models are in pretty tightÂagreement already, with a few outliers of course, that 95L will be over the Lesser Antilles late this weekend but as a what? Due to increasing wind shear and a ton of dry air courtesy of the Saharan Dust annual invasion, 95L is forecast to develop into a TS but peter out before reaching the islands on Saturday. 95L also has to break free from the ITCZ and strengthen in order to turn more WNW as if it remains weak, it will take a more westerly track.Â Will or can it make Cat 1 status? Yes, possible but probably not although, as evidenced by the last few years, do not take anything for granted. Bottom line is a good rain producer with windy conditions are to be expected this weekend at some point. We do need the rain but not the wind. If you still have a blue roof, I suggest you tighten it up. Good time to upgrade your hurricane supplies as well as I'm sure some have expired. This season has been downgraded forecast wise due to the possible formation of El Nino and cooler than normal SST's across the MDR or Main Development Region. While that may be true, it only takes one. 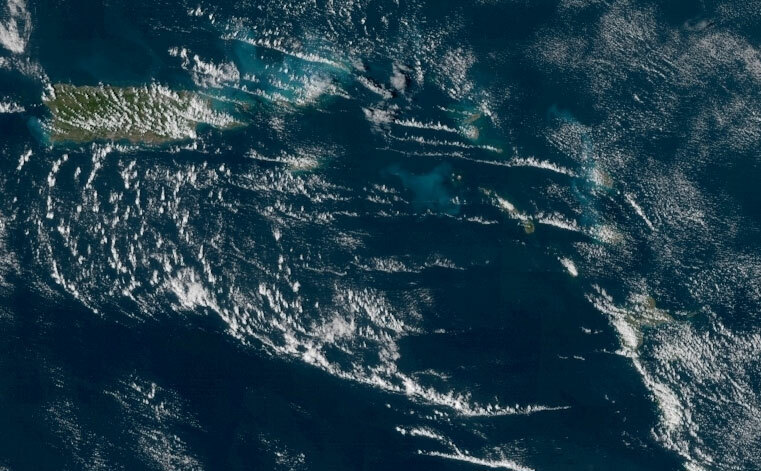 No hurricane news, but I saw this interesting article in Science on the Sargassum that is washing up on some of the beaches in the islands since 2011. A lot of research has been done on this new phenomena. I always thought that the Sargassum came from the Sargasso Sea, a gyre (a large basin-size circulating current) between the Caribbean/North Atlantic Equatorial current and Bermuda. But apparently it is coming from the south and is possibly a different species with wider 'leaves' Researchers from U. Southern Mississippi traced the Sargassum mats all the way back to the east of Brazil. They report 3 generic pathways for Sargassum to float into separate regions of the Caribbean (see this article). Tomorrow is the official start of Atlantic Hurricane Season. Are you ready? Let's hope it won't be as disastrous as 2017! On a good note, the forecasters at Colorado State have just lowered their forecast a bit from their April 5 one. Now they expect 13 named storms (was 14, 12 is 'normal'), 6 hurricanes (was 6, 6.5 is normal) and 2 major hurricanes (was 3, 2 is normal). The probability of at least one major hurricane tracking through the whole Caribbean region (a big area) is 41%, which is about average. Although it doesn't look like an El Nino will be forming this Summer (lowering activity), they base the lower estimate mainly on the current cooler sea surface temperatures in the Atlantic. Read more on their website. June 1 update: Maybe some clarification needed... The researchers did not estimate the number of deaths at about 4600. The 95% confidence interval is 793-8498 casualties. 4,645 (a much reported number) is the average of those two extremes. Other studies have estimated the death toll at about 1,000. Read more in this Washington Post article. Subtropical storm Alberto formed just to the east of Tulum, Mexico. It is subtropical because the heavy thunderstorms are far removed from the center. If they move closer to the center it might become a tropical storm. Don't confuse this with an extratropical storm. Those have a cold core and don't derive their energy from the warm seawater. Rain, rather than wind, will be the main threat for the Yucatan and later the Gulf states. Incidentally NOAA's Climate Prediction Center came out with their hurricane forecast. They predict a 35 percent chance of an above-normal season, a 40 percent chance of a near-normal season, and a 25 percent chance of a below-normal season. Not really sure how they came to this conclusion because they also write that sea surface temperatures are expected to be near-normal and that a weak El Nino might be forming. This would result in a near-normal or below-normal season. But they also note that "atmospheric and oceanic conditions" in general are more conducive to more and stronger hurricanes forming. I guess they mean climate change, but are not allowed to call it that... See the NOAA website for more. Doesn't seem right now does it? Already, here we are about ready to start off another hurricane season and we haven't even fully recovered from last season's twin sister Cat 5's Irma and Maria. Congratulations to Lisette Stevens on the island of Dominica who went 8 months without power and just received it yesterday, May 21st. To put it inÂperspective, I went 111 days without power.ÂLisette went 258 days and nights!! Sadly, there are still others without power and will continue to be down island and in Puerto Rico. Invest 90L. Starting things off a tad early to the start of the 2018 hurricane season but not unusual at all. Having been declared an Invest by the NHC, 90L will get more scrutiny from the high end hurricane models the NHC uses is addition to more attention from the local authorities potentially in 90L's path. That path is uncertain right now as, east of Belize, there is high wind shear and unfavorable SST's which will deter development, for the meantime. However, as 90L moves slowly towards the NNE, it will pass over marginally warm enough waters with diminishing wind shear which should enable it to become a TD and potentially our first named system, Alberto. Not expected to reach hurricane status, the main issues will be coastal erosion, gusty winds which some models have reaching 65 mph at landfall, and copious amounts of rain between Louisiana and Florida. Florida and the SE coast look to pick up plenty to wipe out any remaining drought which is one plus to this system regardless of development. More in the next few days. Be vigilant people. Start stocking up your hurricane supplies now. If you went through any of last years systems, you should know better and if you didn't, I hope you learned some hard lessons from those of us who did. Thursday, April  5, 2018 10:09AM PDT - "Normal" season ahead? The probability of at least one major hurricane tracking somewhere through the Caribbean is 52% (42% is normal). They also publish a spreadsheet with landfall probabilities for the Caribbean and Central America. For example, for the USVI the probability that at least one major hurricane will pass within 100 miles is 16%, for Anguilla (which I guess includes St.Maarten/St.Martin, St.Barths) it is 11%. Update Feb.17: The move has been completed. There were only minor issues. All is good! relative peace, both worldwide and weather wise!